In 1908, Indian revolutionary Taraknath Das wrote to Leo Tolstoy, by then one of the most famous public figures in the world, asking for the author’s support in India’s independence from British colonial rule. On December 14, Tolstoy, who had spent the last twenty years seeking the answers to life’s greatest moral questions, was moved to reply in a long letter, which Das published in the Indian newspaper Free Hindustan. Passed from hand to hand, the missive finally made its way to the young Mahatma Gandhi, whose career as a peace leader was just beginning in South Africa. He wrote to Tolstoy asking for permission to republish it in his own South African newspaper, Indian Opinion. 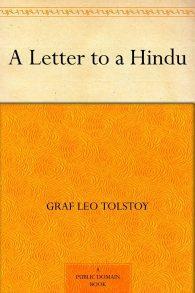 Tolstoy’s letter was later published in English under the title A Letter to a Hindu (free download; public library). A Letter to a Hindu is well worth a read in its entirety, and it’s available as a free download.